You are able to cancel your shift applications as well as approved shifts if this is allowed by your company. Please note, if you need to cancel a shift in less than 24 hours prior to its start time you will need to do it by calling in, otherwise you can cancel a shift via the Parim mobile app or a desktop. 1. Go to your schedule by tapping on 'Schedule' at the bottom of the app. 2. Tap on the shift you wish to cancel and then tap on the red 'Cancel' button. 4. 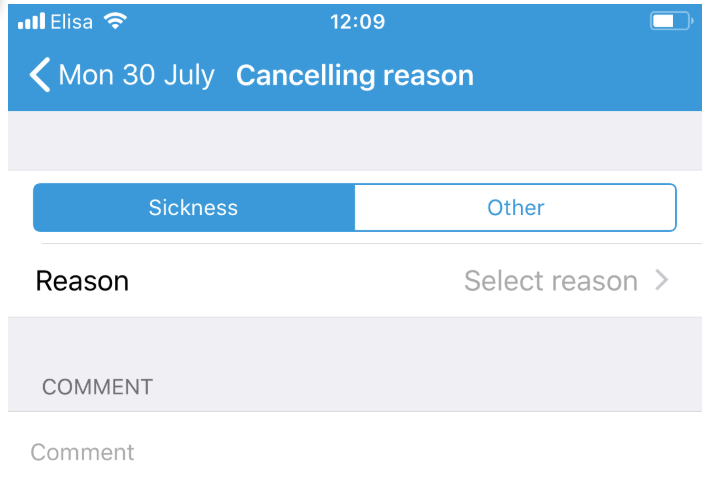 Choose a reason for cancelling an approved shift - whether it's 'Sickness' or 'Other', then add a comment and click on the red 'Cancel shift' button. Your shift has now been cancelled! Find the shift in your calendar and click on it. This will open a little pop up window that among other things has a red 'cancel' button in it. After clicking it, the system will ask you to give a reason for cancelling approved shift, therefore you need to enter required information and leave comment to the management why do you need to cancel this shift. After you have entered all the required information click on 'confirm' and the shift will be cancelled. Find the shift in your calendar and click on it. This will open a little pop up window. Click 'Cancel'. OR you can go to 'Open Shifts' on your toolbar and find the shift - the status will be 'Submitted' and click on the 'Cancel' button there as well.